Back in the early aughts Cal Acad did a huge exhibit simply titled, “Skulls”. It was extremely rad, and I could have been running a separate blog this whole time with nothing but photos from that exhibit. (Update: the website for the exhibit is still going. Check it out.) I was just sorting through some old folders and found some favorites. 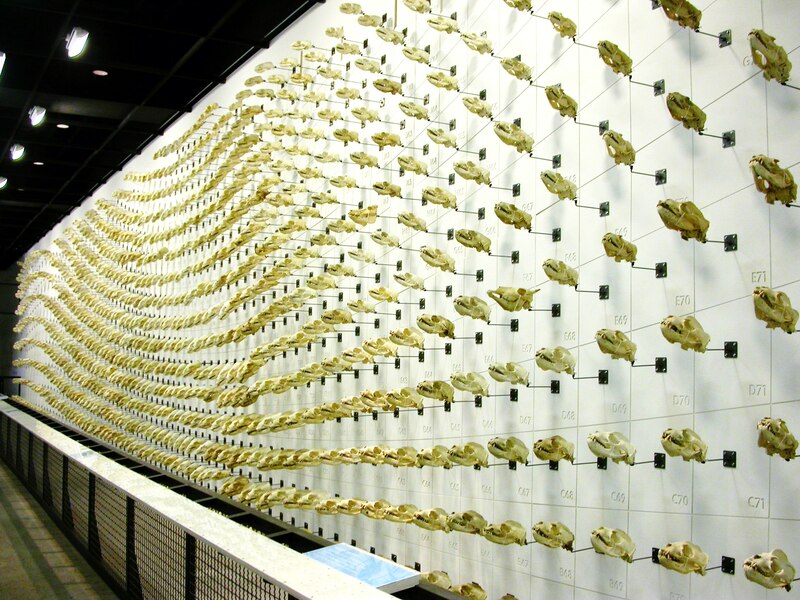 The photo above is the wall of California sea lion skulls, 900-odd in all, arranged from the biggest, gnarliest males on one end to the most gracile females on the other end. 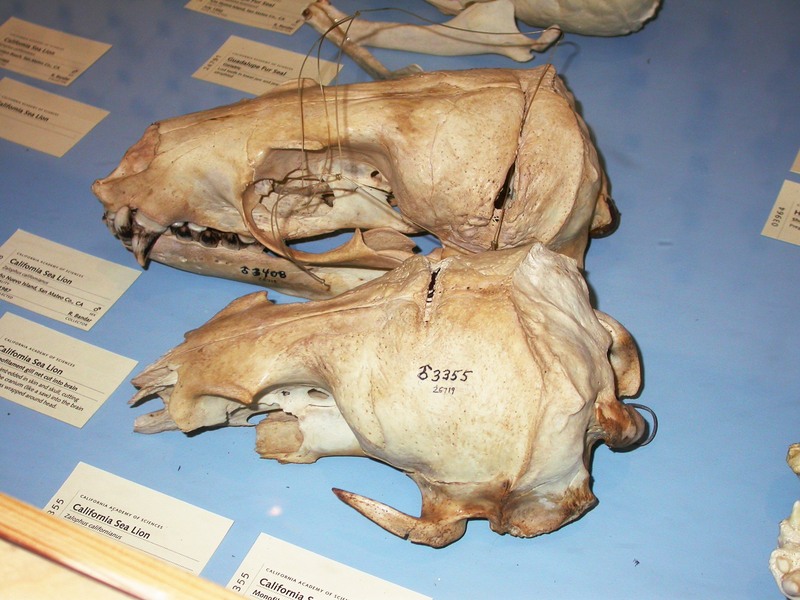 They also had quite a few pathological sea lion skulls. Here are two that haunted me–they got tangled up in fishing lines that slowly sawed through their skulls and into their brains, killing them. This elk had a pretty funky growth on its right dentary. 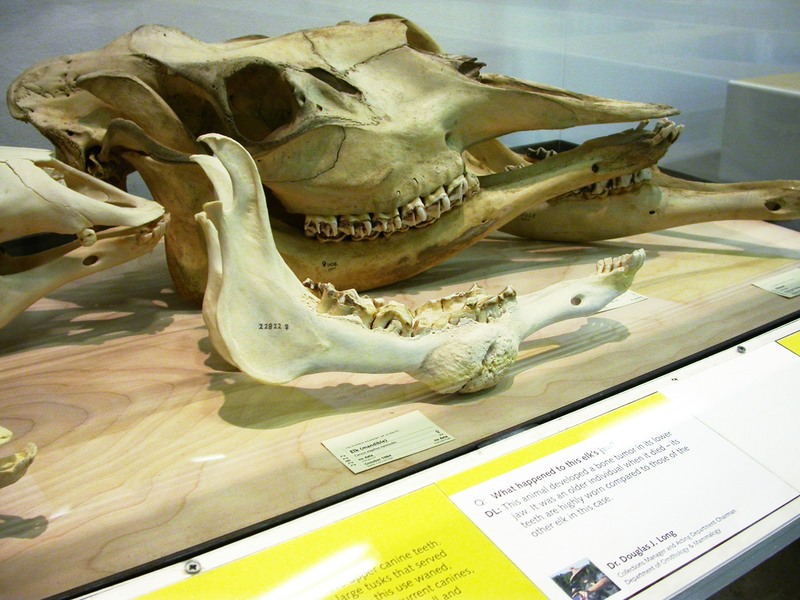 But easily the most “Naw!”-inducing pathology in the whole exhibit was this poor deer, which has a pathological growth the size and shape of a big pastry where its right eye used to be. 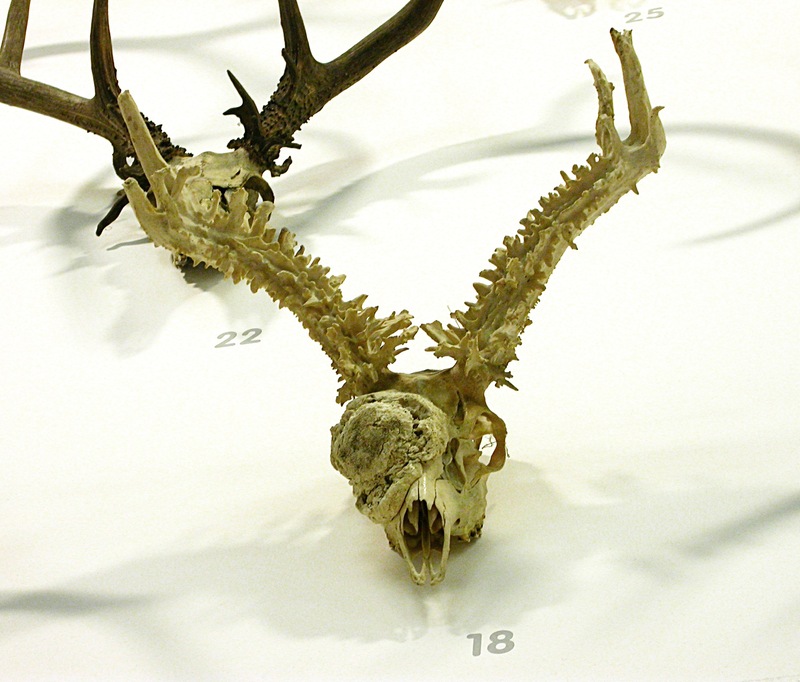 I don’t know if it’s just a coincidence that its antlers are all wonky, too–maybe Darren will show up and enlighten us. So if you’re feeling down, you can at least console yourself that you don’t have a flyblown, pus-leaking cinnamon roll of pathological bone growing on your face. Have a nice day! 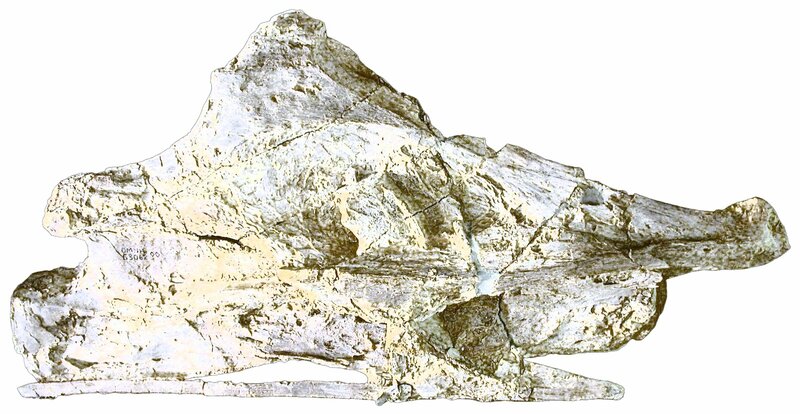 Another–and perhaps more important–area where surface models excel is when you can remove colors on the original specimen that wash out relevant details…I bet this is probably the case for the example vertebra of Sauroposeidon. How many fossae and foramina just don’t show up well on the photos above? Andy was talking about completely colourless 3d surface models, in which the 3d shape allows a render to make shadows that bring out the subtle shapes. But it made me wonder whether we could get anywhere just by washing out the most prevalent colour in the photo. I’m not sure that isn’t the best of the bunch, in terms of informativeness. I would say this is of some value; but it’s nowhere near as good as, for example, the anaglyph of Cervical S of the Archbishop. I could sit and look at that one all day. The problems with this one arise for three reasons. 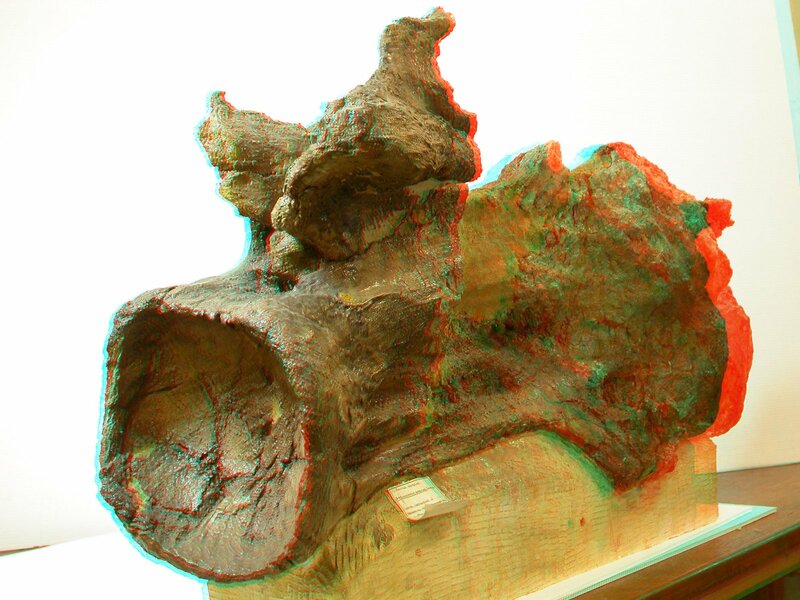 First, I had to reduce both parts of the Sauroposeidon anaglyph to monochrome (since one was already in that form), so all colour information was lost. Second, I had to scale the high-resolution picture to the same size as the lower-resolution one, throwing away more detail. Finally, and most important, the two photos were not taken with the intention that they should be used to make an anaglyph. To work well, this has to be done with the images taken under the same lighting conditions, at the same distance from the specimen, from perspectives differing by about the distance between the pupils of the viewer, and with the camera-position difference being perfectly in the plane of the specimen. Needless to say, none of these conditions was met in this case, so it’s actually quite impressive that it works as well as it does. We have a lot of options for illustrating specimens these days. Postage-stamp-sized greyscale photos really don’t cut it any more. 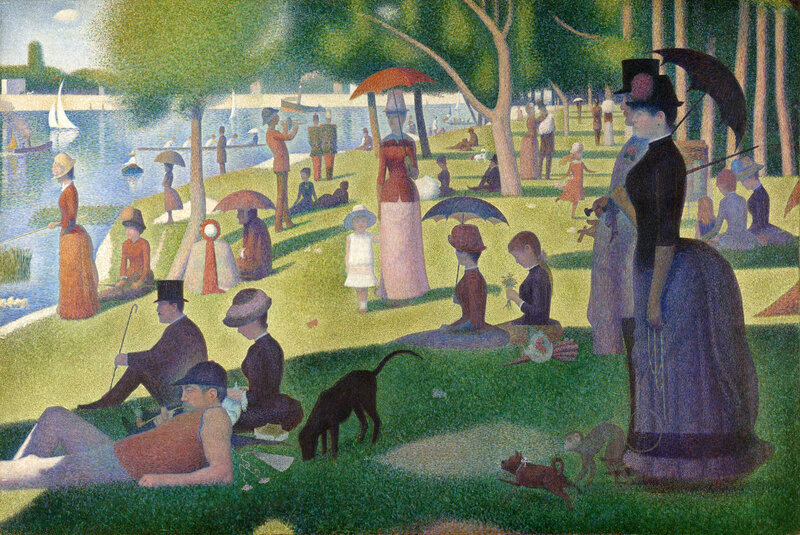 So sings Dot in Move On, the climactic number of Stephen Sondheim’s Pulitzer Prize-winning music Sunday in the Park with George, which on the surface is about the post-impressionist painter Georges Seurat, but turns out to be a study of obsession and creativity. “Taught me how to see”? What kind of talk is that? One the surface, it seems silly — we all know how to see. We do it constantly, without thinking. Yet it’s something that artists talk about all the time. And anyone who’s sat down and seriously tried to paint or draw something will have some understanding of what the phrase means. We have such strong implicit ideas of what things look like that we tend to reproduce what we “know” is there rather than what’s actually there. Like I said, we see without thinking. In fact, the psychology of perception is complicated and sophisticated, and the brain does an extraordinary amount of filtering of the visual signals we get, to save us the bother of having to consciously process way too much data. This is a whole scientific field of its own, and I’m going to avoid saying very much about it for fear of making a fool of myself — as scientists so often do when wandering outside their own field. But I think it’s fair to say that we all have a tendency to see what we expect to see. 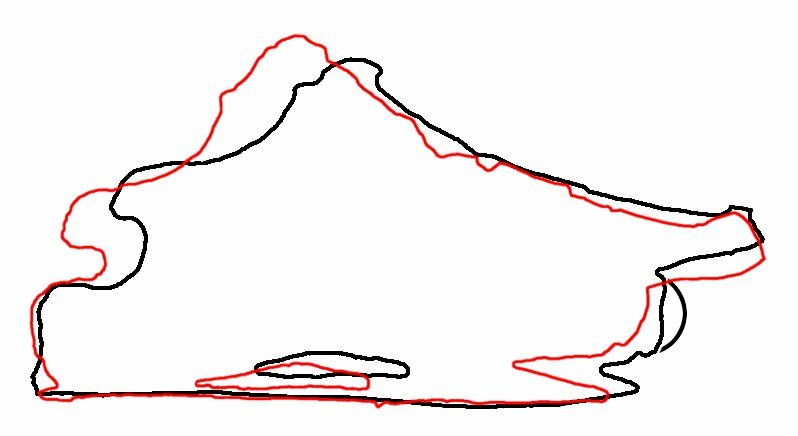 In the case of sauropods, this tendency has meant that we’ve all been startlingly bad at seeing pneumaticity in the caudal vertebrae of sauropods. Because the literature has trained us to assume it’s not there. 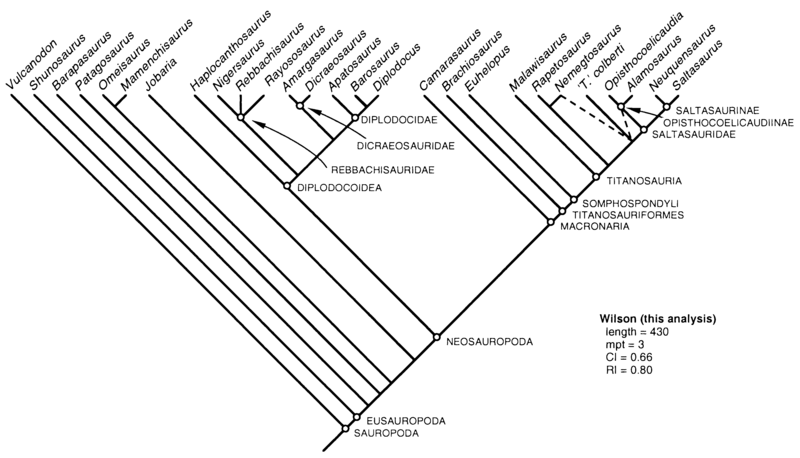 For example, in the two competing sauropod phylogenies that dominated the 2000s, both Wilson (2002) and Upchurch et al. 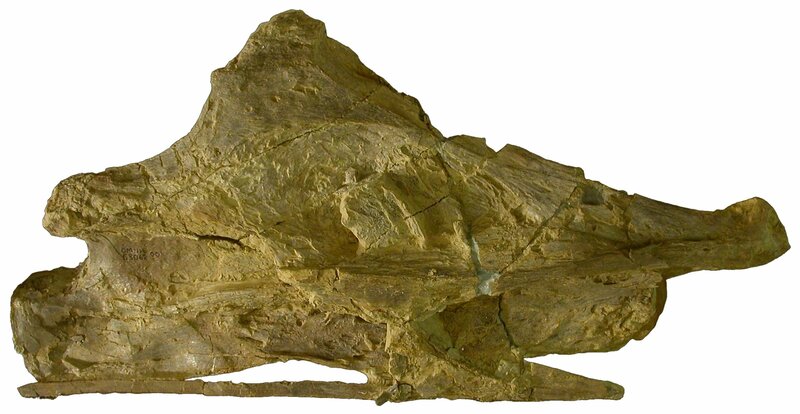 (2004) scored caudal pneumaticity as very rare: Wilson’s character 119, “Anterior caudal centra, pneumatopores (pleurocoels)”, was scored 1 only for Diplodocus and Barosaurus; and Upchurch et al. (2004:286) wrote that “A few taxa (Barosaurus, Diplodocus, and Neuquensaurus) have pleurocoel-like openings in the lateral surfaces of the cranial [caudal] centra that lead into complex internal chambers”. That’s all. And that’s part of the reason that every year since World War II, a million people have walked right past the awesome mounted brachiosaur in the Museum Für Naturkunde Berlin without noticing that it has pneumatic caudals. 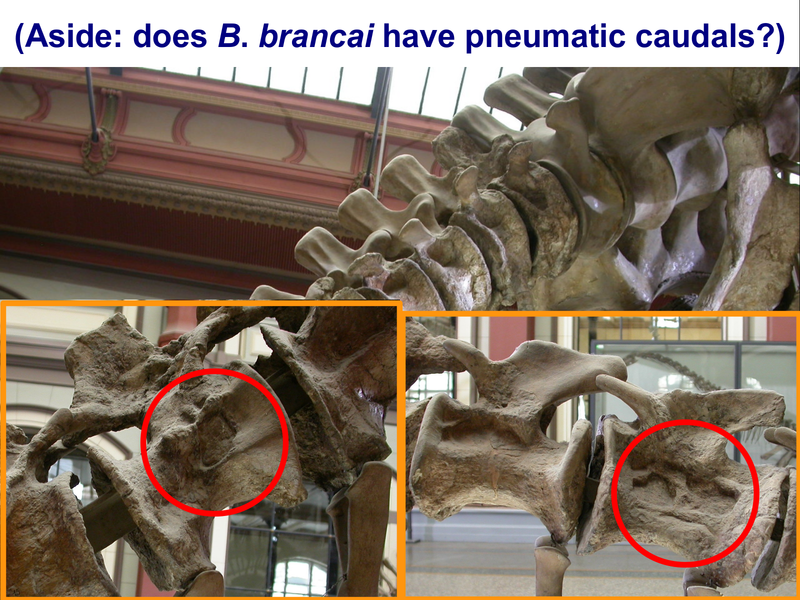 After all, we all knew that brachiosaur caudals were apneumatic. And looking at that picture made me wonder: those dark areas on the sides of the first few caudals (other than the first, which is a very obvious plaster model) certainly look pneumatic. 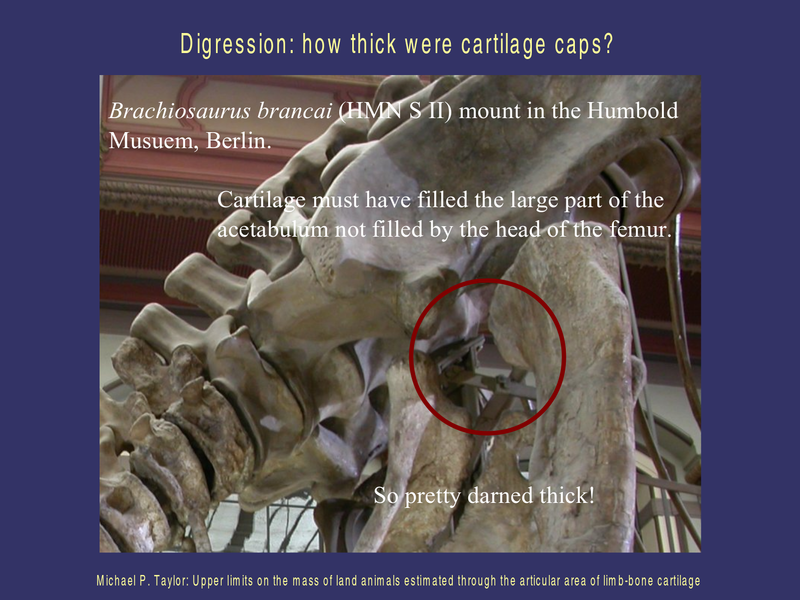 Then a few years later, I was invited to give a talk at the Museum Für Naturkunde Berlin itself, on the subject “Brachiosaurus brancai is not Brachiosaurus“. (This of course was drawn from the work that became my subsequent paper on that subject, Taylor 2009) And as I was going through my photos to prepare the slides of that talk, I thought to myself: darn it, yes, it does have pneumatic caudals! Those photos were pretty persuasive; and a closer examination of the specimen on that same trip was to prove conclusive. Earlier in 2009, I’d been in Providence, Rhode Island, with my Index Data colleagues. I’d managed to carve a day out of the schedule to hop along the coast to the Yale Peabody Museum in New Haven, Connecticut. 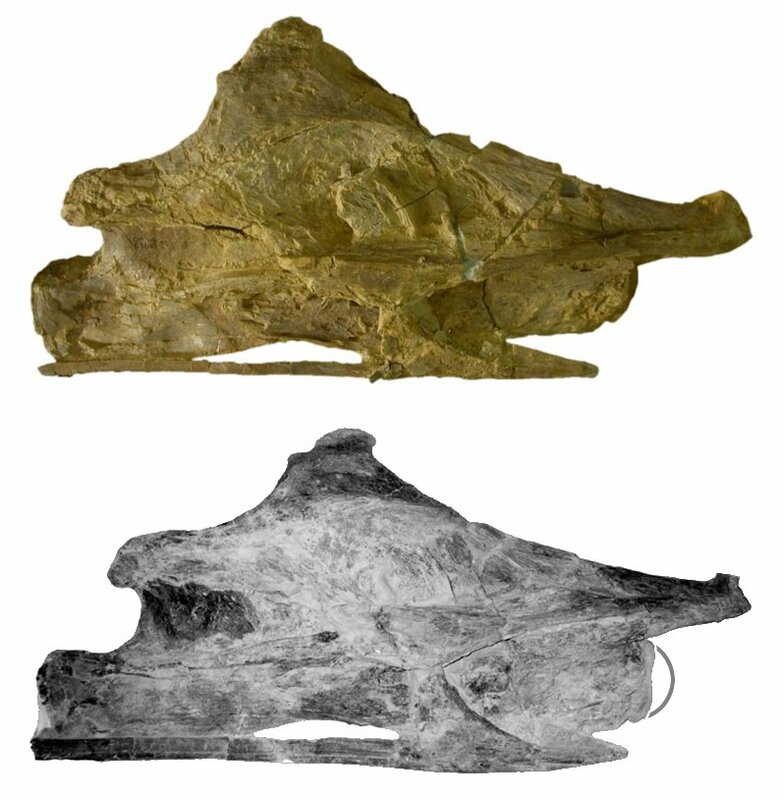 My main goal was to examine the cervicals of the mounted Apatosaurus (= “Brontosaurus“) excelsus holotype (although it was also on that same trip that I first saw the Barosaurus holotype material that we’ve subsequently published a preprint on). The Brontosaurus cervicals turned out to be useless, being completely encased in plaster “improvements” so that you can’t tell what’s real and what’s not. hopefully one day they’ll get the funding they want to take that baby down off its scaffold and re-prep the material. But since I had the privilege of spending quality time with such an iconic specimen, it would have been churlish not to look at the rest of it. And lo and behold, what did I see when I looked at the tail but more pneumaticity that we thought we knew wasn’t there! 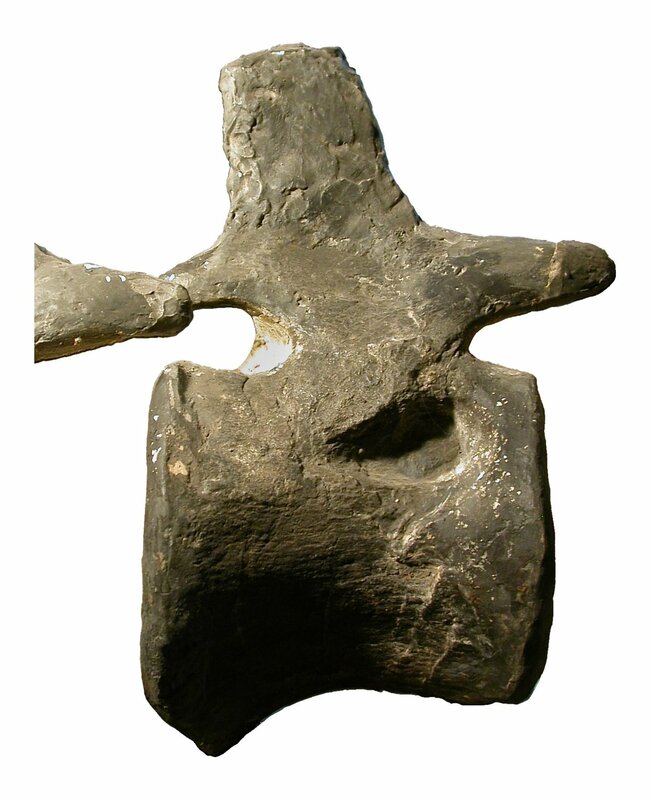 An isolated pneumatic fossa is present on the right side of caudal vertebra 13 in Apatosaurus excelsus holotype YPM 1980. The front of the vertebra and the fossa are reconstructed, but enough of the original fossil is visible to show that the feature is genuine. (Wedel and Taylor 2013b: Figure 10). What does this mean? Do other Giraffatitan and Apatosaurus specimens have pneumatic tails? How pervasive is the pneumaticity? What are the palaeobiological implications? Stay tuned! All will be revealed in Matt’s next post (or, if you can’t wait, in our recent PLOS ONE paper, Wedel and Taylor 2013b)! Here’s a nice thing: friends and relatives just assume (correctly) that I will want whatever dead animals they find. 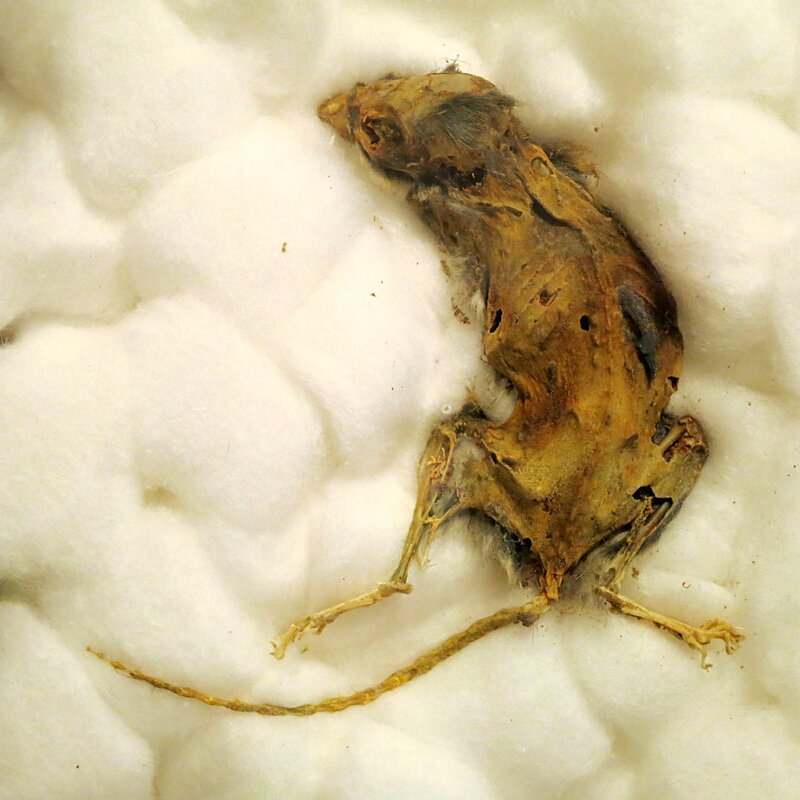 So I was not completely surprised when I got a call from my brother Ryan (pillager of the Earth) asking if I wanted a dead mouse he’d found mummified at the back of an unused cupboard. Happily this was over the holidays so I could get the specimen in person and not have to deal with mailing it. That’s my boy! I didn’t have the heart to tell him that some people don’t have a ready supply of rats lying around. He’s not old enough to understand that level of deprivation. So, obviously the mummified mouse was going to show-and-tell. But I didn’t want it to get destroyed. 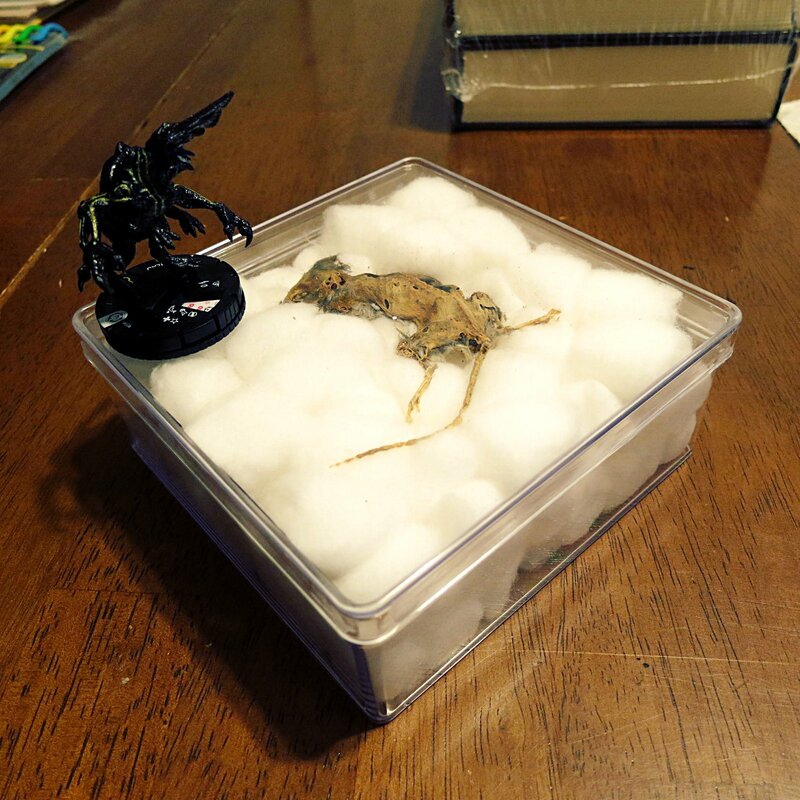 My cheap and low-tech solution was to get a rigid plastic display box from the local hobby store ($5.99 for a two-pack) and stuff it with cotton balls. We cleared some of the cotton around the skull first so it would be more visible. Knowing how third-graders can be when exciting things get passed around, I also glued the lid on. The mouse and the cotton balls are completely immobile even when violently shaken, and hopefully they’ll stay that way indefinitely. I forgot to include a scale bar in either of these photos or to measure my damned murine, but the box lid is 5 inches on side. HeroClix Knifehead showed up because kaiju are notorious attention hogs. Now, to see if Mousenkhamun can survive the rigors of third grade. I’ll keep you posted.